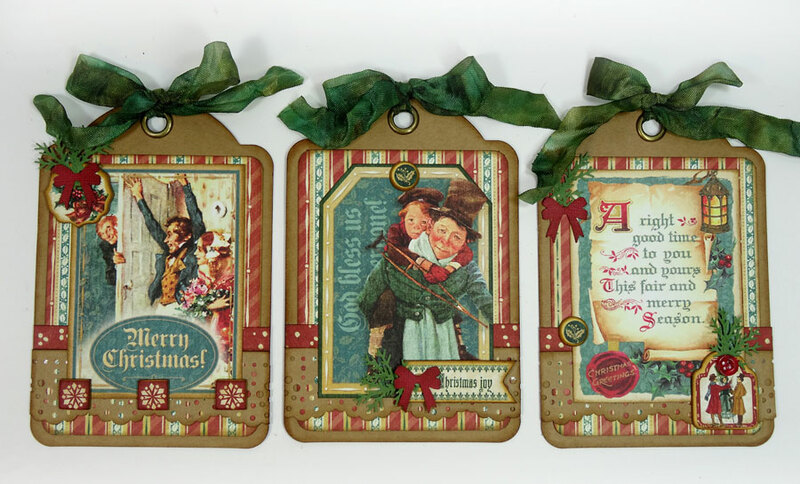 Holiday Cards & Tags Workshop is Here! Good Monday morning all! 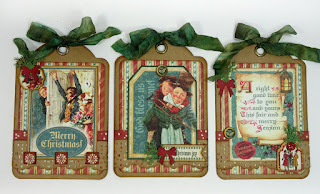 As promised in my last post, I'm here today to share my Holiday Cards & Tags Workshop Tutorial which is ready for you in my Etsy shop now. My $12.00 tutorial includes lots of detailed photos and step-by-step directions you'll find easy to follow as you create the projects you see in the photo above. 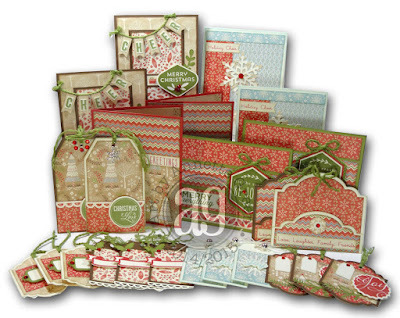 For you to have access to my Cricut files, you'll need the Close To My Heart "Artistry" Cricut cartridge and Cricut's Design Space online software. 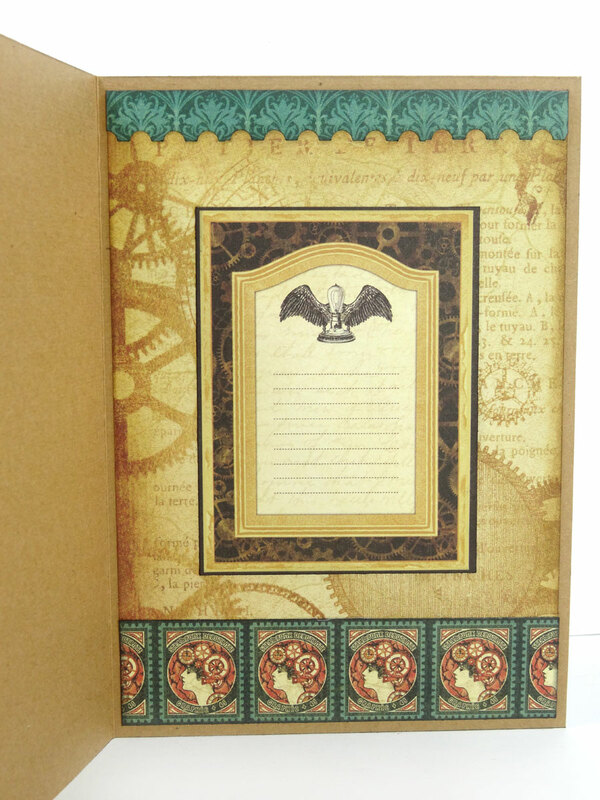 As I stated in my last post, you can make multiple sets of this workshop with more papers and just a few more embellishments. See the full supply list in my last post for all the details. Whether you use my tutorial to make these for yourself or to teach your customers and friends, you're sure to enjoy the ease of this workshop. The design work is done, the customized Cricut cuts are done, the directions are typed, so all your brain has left to do is follow along and enjoy! Thanks so much. Let me know if you have any questions and I will promptly reply right here on my post for all to see the answers. Hello everyone. I hope you're having a good week. If you've followed me very long, you know that I usually host my annual Holiday Workshop around November, however due to so many other commitments I have been unable to keep this up the past few year. It breaks my heart when people ask me if I'll be doing it again this year. I wish I could. Really I do. It's a really fun day for me as well as my guests. So I got to thinking about it and thought I would offer the same type of workshop I would normally host, only in a tutorial format rather than as an event. We're all so busy these days, I figure it might be a good idea for YOU as well as me. 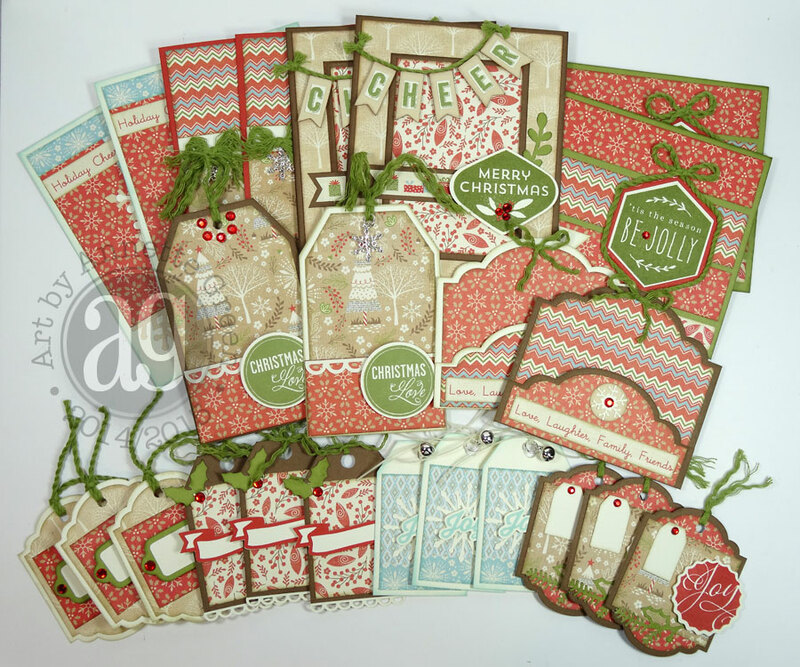 In this line of thinking, I designed my Holiday Workshop 2015 using Close To My Heart's product line and newest Cricut cartridge "Artistry." I've created 8 cards, 12 small gift tags, and 4 gift card holders. 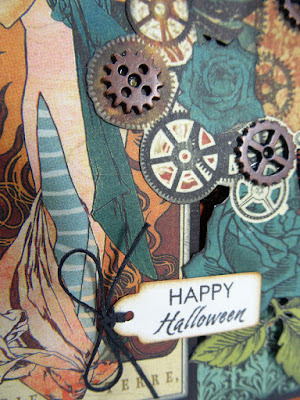 I'll be posting all the details on my blog Monday, October 26th, but thought I'd share a little sneak peek today. Another reason to share this with you today is so you can order your supplies in advance and make sure to include the October Stamp of the Month "Twinkle" in your order. If you don't have a Close To My Heart consultant, I recommend my friend Jacki Tibbitts. Ink pads: (CTMH) Cashmere, Fern, Glacier, Cranberry, and Chocolate. Starting Monday on my Etsy site, I'll be offering my complete tutorial in PDF with step-by-step clear instructions and photos as well as the link to my Cricut files I've created specifically for this workshop for $12. The great part is it's SUPER easy! Most of the cuts are on the Cricut and the rest are simple cuts with your paper trimmer. You'll have such fun with this! And if you need more cards and tags, well, all you have to do is order more of the paper and the charms to get you there. You'll have plenty of the Red Enamel Gems and the Fern Thick Twine to do another set of everything. Here's another peek at the workshop below. Stay tuned on Monday for the link and more details. And if you have any questions in the meantime, let me know here. Thanks and have a great day! Two Holiday Class Offerings Around Florida! Hey friends. After designing all sorts of fun Halloween projects, I've now moved on to Christmas! 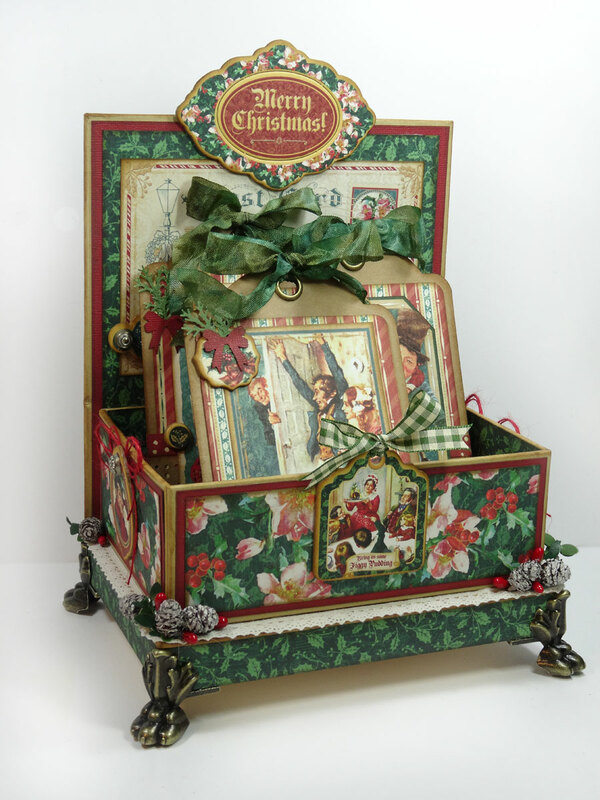 I've been working away in my studio designing projects for the holidays that I'd love to share with you today. 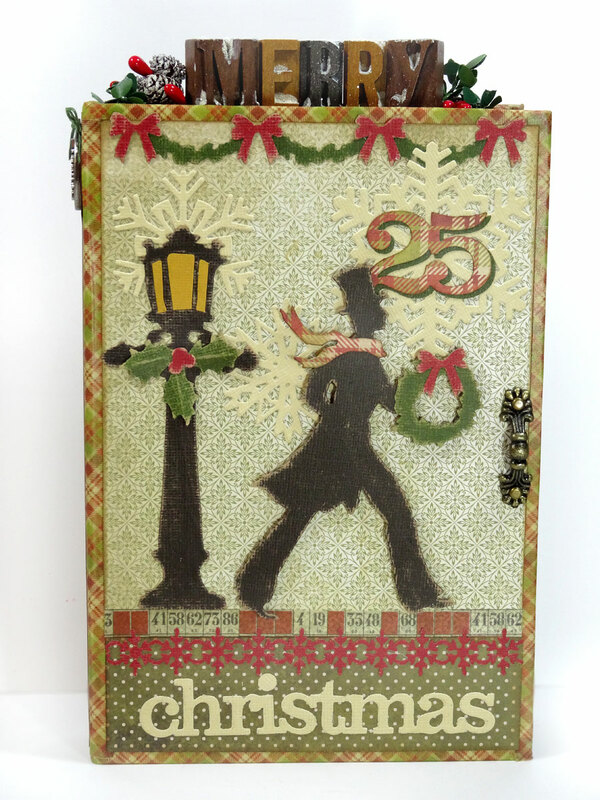 First is this Holiday Card & Tag Keeper using Graphic 45's Christmas Carol Collection. 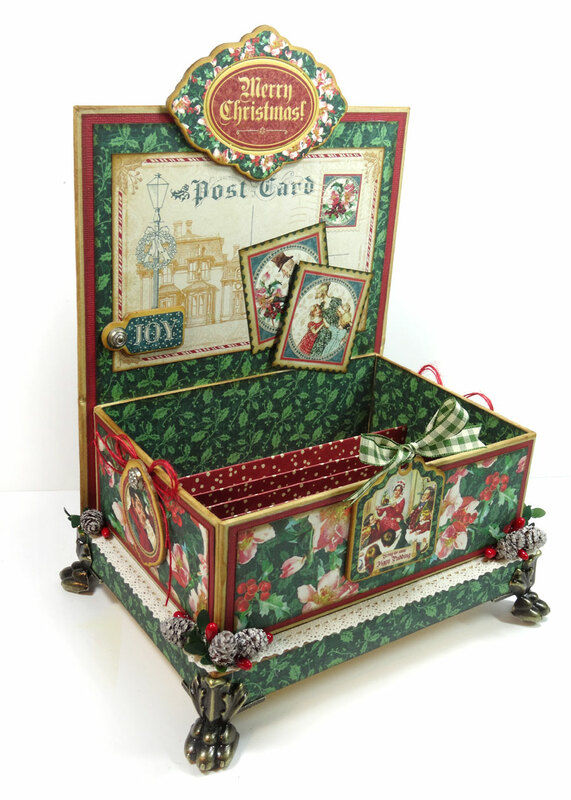 I'll share how to transform Graphic 45's Kraft Book Box into a lovely holiday display piece where you can store Christmas cards or pretty tags you can attach to your holiday packages. Three kraft tags are included in the project. We'll work with the new ornate metal claw feet, coordinating chipboard, trims and ornate brads, and I'll share a fun and easy accordion fold technique for the inside to support cards and tags. 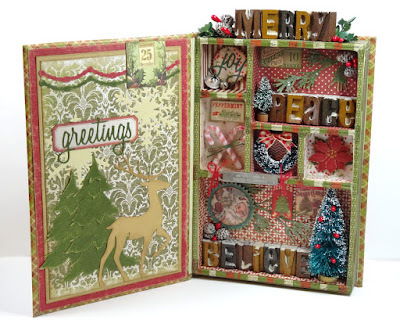 I'll be teaching this class at Violettes Scrapbook Store in Lakeland, Saturday, December 5th and at Whim-so-doodle in St. Petersburg, Saturday, December 12th. Click on the links to contact these fantastic stores for all the details and to sign up. Second is my Yuletide Configurations Book using all sorts of fantastic Tim Holtz Idea-ology products. We'll create this festive display piece using the new Holiday Letterpress letters, Jingle Brads, Holiday Design Tape, Boxwood Twine and the new Yuletide paper stash in the mini configurations book. 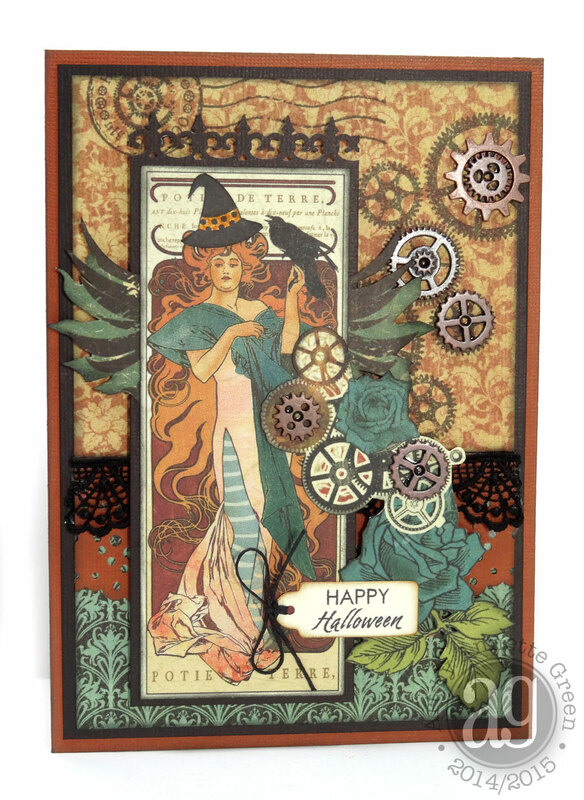 And I'll share lots of great techniques for making the most of Kraft Core card stock die-cuts from a plenitude of Tim's dies. I'll be teaching this project at both stores listed above on the same dates, so please contact them directly to sign up. In addition, I'll be teaching this one locally (Melbourne, FL) on Sunday, November 22nd. Contact me directly at AnnetteGreen@me.com for details if you're interested in this class date and I'll send you a detailed PDF. 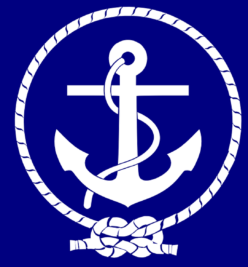 I'm super excited and hope this is the start of more travel teaching in 2016! Happy Friday everyone! Thanks for stopping by today. I'm still enjoying lots of Halloween crafting and today is no exception. 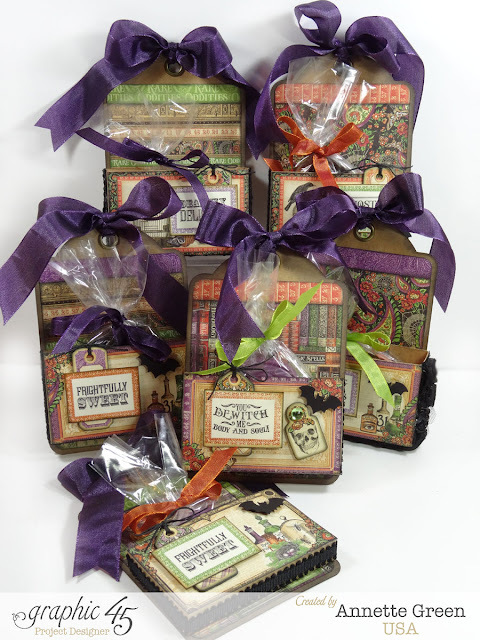 I've got some easy and fun Halloween Treat Holder Tags to share with you, made with Graphic 45's Rare Oddities collection which includes a video tutorial. 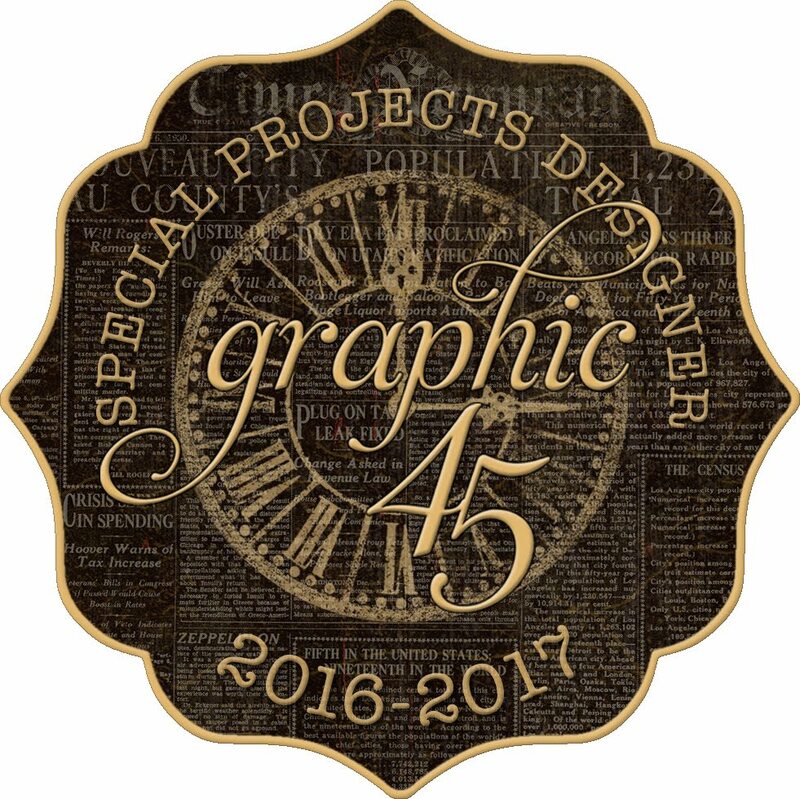 I'm featured over on the Graphic 45 blog sharing this project alongside my fellow Special Projects Designer Gloria Stengel. All month, the gang's been sharing their creations using The Groove tool by Art-C. 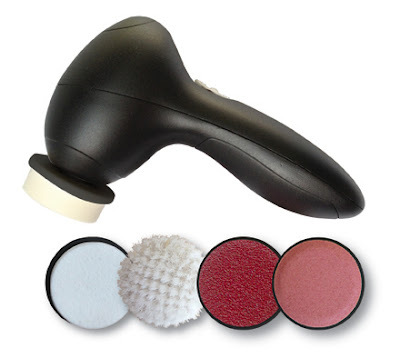 This fun little gadget can be found in major craft stores and includes all that you see here. Additional attachments are sold separately for easy replacement. My video shows how easy and fun this handy tool is, so be sure to hop over to the Graphic 45 blog and check out how I used it to make these treat holders. Thanks again for stopping by. Have a great weekend. In case you missed it on my Facebook and Instagram over the weekend, here's my easy Snapguide tutorial for making your own spooky Halloween necklace for the season using lots of Tim Holtz goodies. 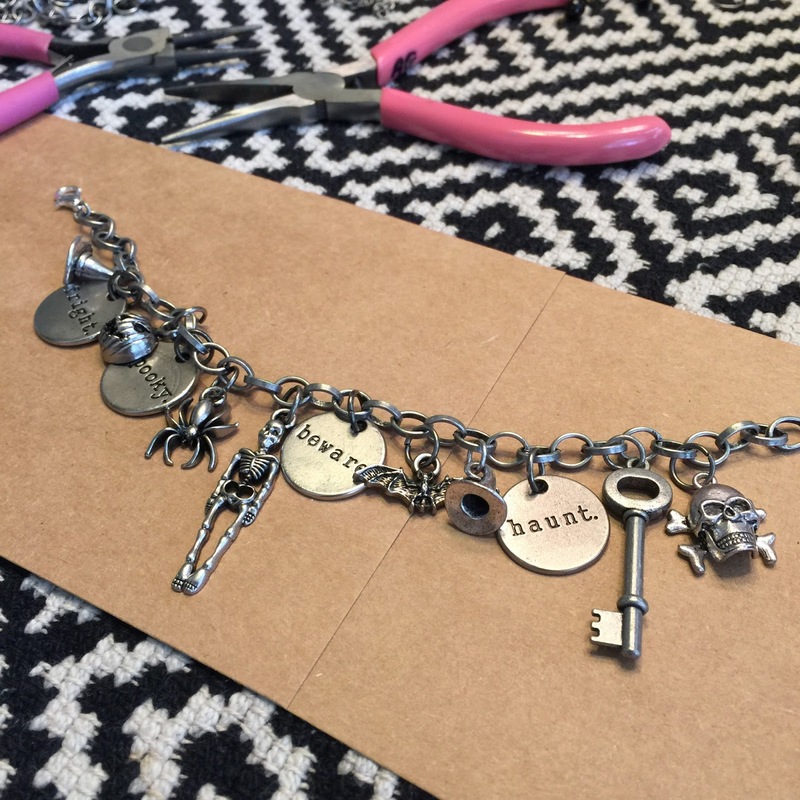 And scroll below to see my Halloween charm bracelet I completed in less than a half hour! 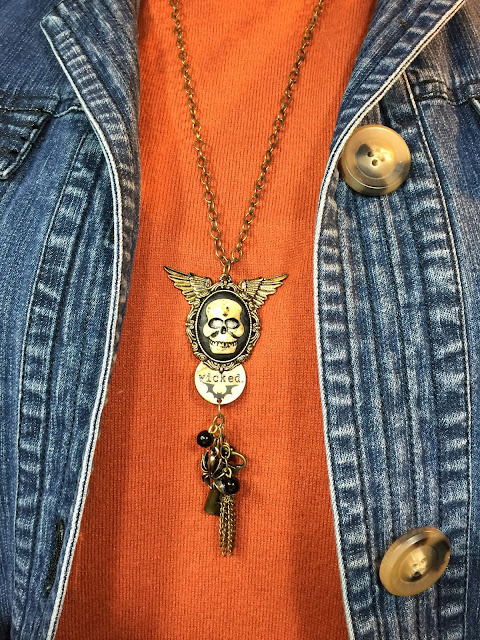 Check out How to Make a Spooky Halloween Necklace by Annette Green on Snapguide. Hello and happy Friday once again. It's a Just for Fun Friday here on my blog and today I'm sharing a non-traditional Halloween card. 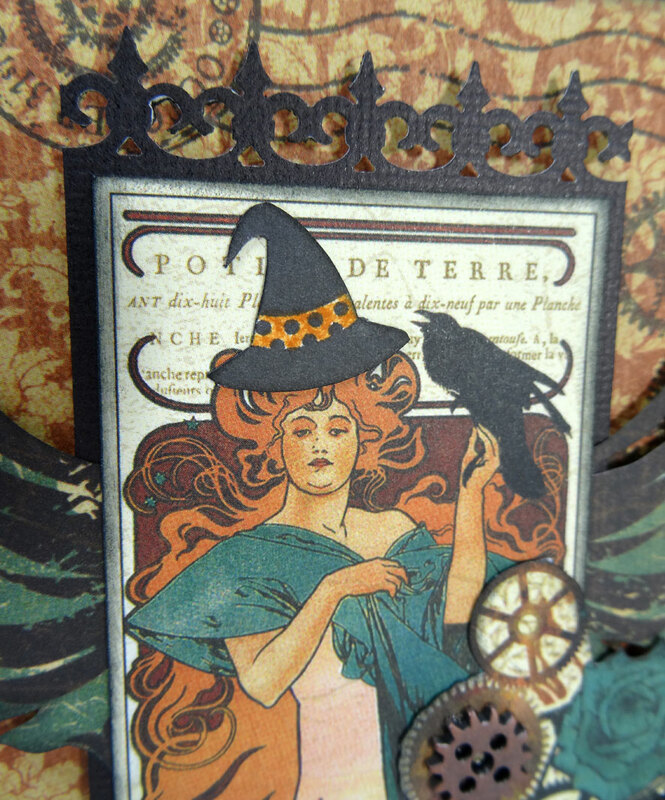 I'll be getting together with friends for some cardmaking tomorrow which works out nicely since it's World Card Making Day. In the spirit of this fun day, I thought I'd share a Snapguide tutorial on how to make this card. See below, and enjoy! 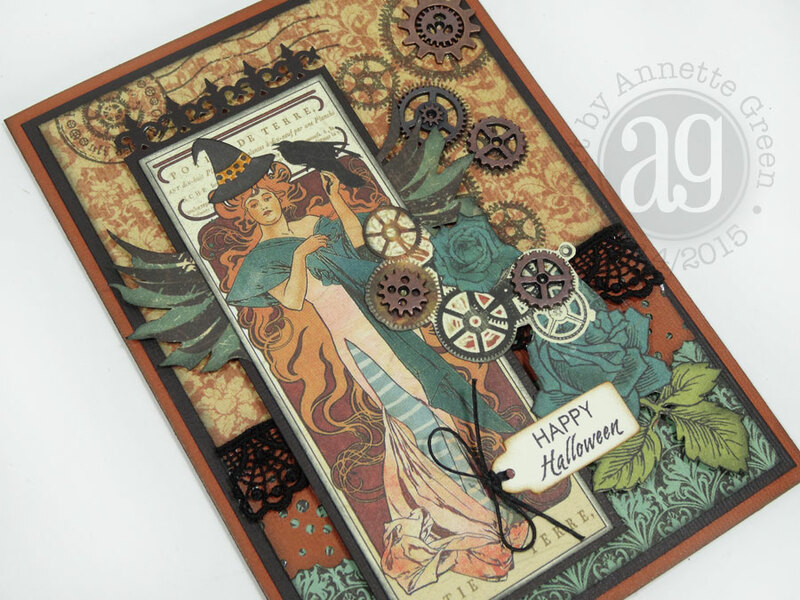 Check out How to Create a Steampunk Halloween Card by Annette Green on Snapguide.